Ive been playing with bronzclay lately. Now that Im using Paste Maker instead of water its not giving me the fits it used to before I switched over to copper. I thought I may have switched over to copper for good, I mean I still have 500 grams of it waiting to be used. Yes 500 grams. I apparently bought 2 200 gram packs a while ago. Im going to finish up this pack of bronze, then switch over to copper for a bit. 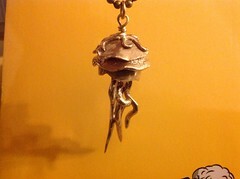 Im looking forward to making copper jellies soon.